They say beauty is in the eye of the beholder. Lay your hands on this beauty! We crafted the Mister/Sprayer from the ground up to maximize usability and longevity while maintaining a high level of value. ★ The base has a flat stability ring to prevent accidental tip overs. ★ The translucent bottle with measuring marks is made from heavy duty industrial grade plastic. ★ The Pump Handle is well-appointed with a contoured grip for comfort and easy pull trigger for one hand operation. ★ The trigger has a trigger lock which may be slid into place for use on larger jobs to reduce fatigue. ★ The top of the handle houses the red pressure relief valve to utilize between jobs and the sleek pump handle designed for easy pressurization. ★ The adjustable brass nozzle is sure to meet a variety of plant care needs. Close the valve for a fine mist and a 1/4 turn in the opposite direction for a 20-25' stream at your fingertips. ★ The brass nozzle is also multi-directional to hit hard to reach areas while on the job. ★ Matching carrying strap and bag/belt clip for added portability. Way Beyond Plants...Use Your Imagination! 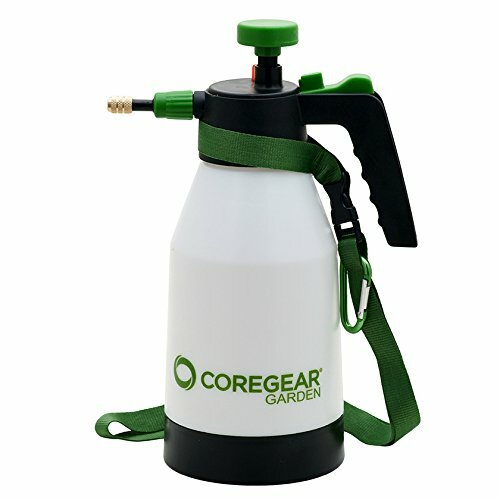 Explore all you can do with this CoreGear Mister/Sprayer. Keep your family/pets cool, detail the car, remove wallpaper, etc. Keep them labeled for safety - correct mixture on intended target! How sweet it is to do business with a company that backs up its products with a 100% satisfaction guarantee and replacement parts on Amazon. SUBSCRIBE AND SAVE OR BUY MULTIPLE UNITS TO SAVE EVEN MORE TODAY...CLICK ADD TO CART ABOVE NOW! CONVENIENT HIGH CAPACITY: 1.5 Liter Heavy Duty Plastic Bottle holds over 50 ounces of water based liquid. High capacity tank is large enough to handle almost any gardening task in and around your home. VARIABLE MIST TO STREAM: Multi-directional, brass nozzle adjusts from fine mist to stream. Helps to reach tight spots. Nozzle adjusts to a strong stream reaching over 20 feet. Perfect for high hanging plants and shrubs as well as for spraying pests from a safe distance. EASE OF USE: Easy pressure release located at the top of the handle. Just lift the red pressure release. One hand operation with easy pump and locking trigger mechanism. Frees up your hands while using your favorite garden tools. Perfect for the multi-tasker and those with arthritis or other hand ailments. Carrying Strap and Belt Clip included for added portability. PERFECT FOR YOUR GARDEN TOOL CHEST: Use Neem oil for clean and shiny leaves without clogging the stomata. REPLACEMENT PARTS AVAILABLE ON AMAZON AND OTHER GREAT APPLICATIONS: Fabric Guard, Multi-Surface Cleaner, Waterproofing, Fly Bait, Aerospace Protector, Carpet & Upholstery Protector, Boat & Marine Surface Protector. If you have any questions about this product by COREGEAR, contact us by completing and submitting the form below. If you are looking for a specif part number, please include it with your message.